- but still a great kit. Decals take hours to fit, be warned. As with most of my models, mine remains unfinished with probably only a couple hours to finish ! 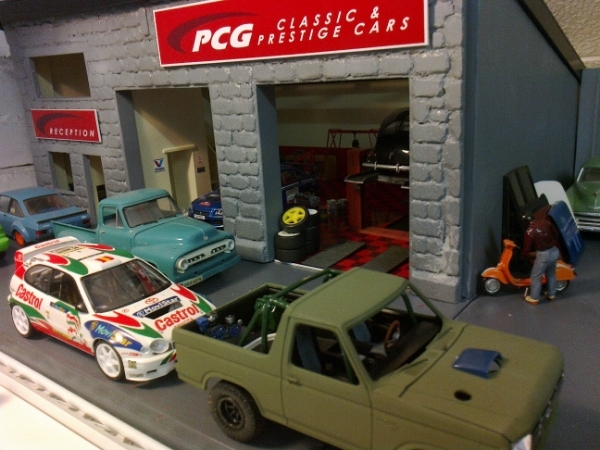 Tamiya is first in fit quality and in decals, as the foto shows. If one wasn't good before doing decals in a Tamiya race/rally kit, they either will be or will quit the model! Your work is always fun and interesting, thanx! Nice kit, a friend of mine build it years ago using some resin part and scratchbuilding few thing, it came out great, it has a lot of potential. Nice start, Paul. I've never understood Revell's cut 'n' stick approach to decals on some kits (I think they look bleedin' awful) and your solution seems ideal. For future reference, how do you rate this kit? how do you rate this kit? im afraid this has come to a grinding halt! That's a pity - it's the decals that really make these models.